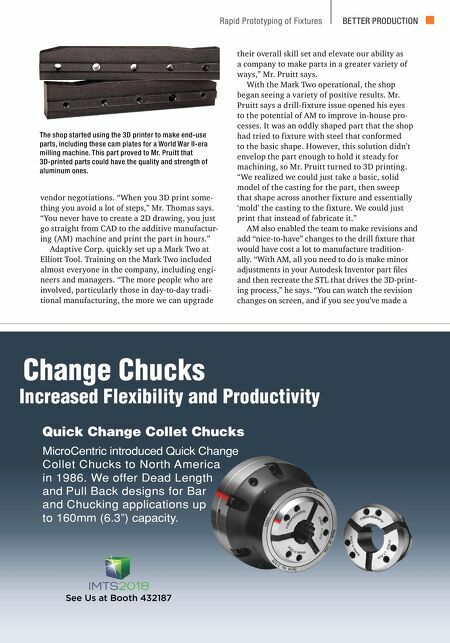 MODERN MACHINE SHOP 111 BETTER PRODUCTION Rapid Prototyping of Fixtures Quick Change Collet Chucks MicroCentric introduced Quick Change Collet Chucks to North America in 1986. We offer Dead Length and Pull Back designs for Bar and Chucking applications up to 160mm (6.3") capacity. 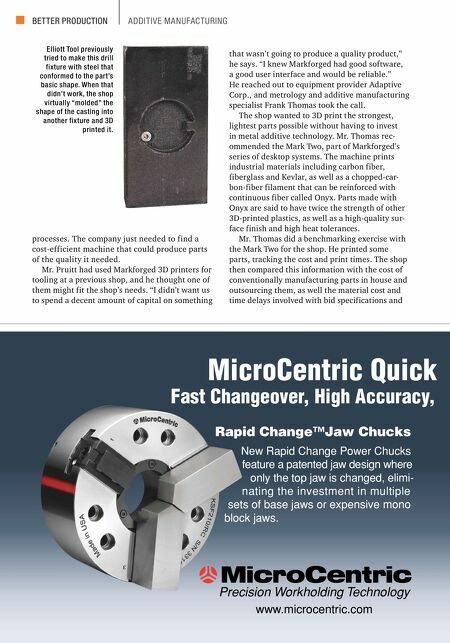 Increased Flexibility and Productivity Change Chucks See Us at Booth 432187 vendor negotiations. "When you 3D print some- thing you avoid a lot of steps," Mr. Thomas says. "You never have to create a 2D drawing, you just go straight from CAD to the additive manufactur- ing (AM) machine and print the part in hours." Adaptive Corp. quickly set up a Mark Two at Elliott Tool. Training on the Mark Two included almost everyone in the company, including engi- neers and managers. "The more people who are involved, particularly those in day-to-day tradi- tional manufacturing, the more we can upgrade their overall skill set and elevate our ability as a company to make parts in a greater variety of ways," Mr. Pruitt says. With the Mark Two operational, the shop began seeing a variety of positive results. Mr. Pruitt says a drill-fixture issue opened his eyes to the potential of AM to improve in-house pro- cesses. It was an oddly shaped part that the shop had tried to fixture with steel that conformed to the basic shape. However, this solution didn't envelop the part enough to hold it steady for machining, so Mr. Pruitt turned to 3D printing. "We realized we could just take a basic, solid model of the casting for the part, then sweep that shape across another fixture and essentially 'mold' the casting to the fixture. We could just print that instead of fabricate it." AM also enabled the team to make revisions and add "nice-to-have" changes to the drill fixture that would have cost a lot to manufacture tradition- ally. "With AM, all you need to do is make minor adjustments in your Autodesk Inventor part files and then recreate the STL that drives the 3D-print- ing process," he says. "You can watch the revision changes on screen, and if you see you've made a The shop started using the 3D printer to make end-use parts, including these cam plates for a World War II-era milling machine. This part proved to Mr. Pruitt that 3D-printed parts could have the quality and strength of aluminum ones.